1. Pink Lemonade Jello Shots: Ok so not strictly a cocktail but the jello is sort of made from a cocktail/ mocktail of sorts and as I was looking to find recipes that could be easily made before hand, I thought these would make a brilliantly unique addition to your cocktail bar. 2. Lavender & Grapefruit Gin Buck Cocktail: I haven’t ever tasted a buck or a mule before but I have it on good authority that this is a good recipe for warm weather and combines gin with ginger beer, grapefruit and lavender syrup. Now that’s some sort of flavour combo right there! 3. Watermelon Lime Lemonade: A refreshing mocktail for the watermelon lovers amongst you. This recipe is super simple and just uses juice from a lemon, lime and watermelon. 4. Mango & Plum Sweet Tea Cocktail: If you like sweet tea than you just have to give this a try! This can easily be made in large batches and stored in the fridge overnight to infuse. 5. Tropical Fruit Basil Punch: If you want your guests to feel like they have just stepped on to a tropical island then this is punch for you. It’s fruity with a light peppery tasted thanks to the addition of the basil syrup. This punch can served up in a pitcher or a drinks dispenser and your guests can help themselves to ice and garnishes. 6. Boozy Coconut Flavoured Ice Pops: These remind me of my favourite past time of sucking on ice pops when I was kid. Well actually I treated myself to one last week but that’s not the point. These boozy ice pops are a fantastic take on everyone’s favourite childhood treat. These are made out of pineapple, coconut and gin and can easily be made days even weeks in advance and stored in the freezer until your guests arrive. 7. Amaretto Bourbon Punch: Amaretto is a favourite of both mine & Jess’s so we seriously need to find a reason to try out this punch – (as if we need a reason!). 8. Floral & Strawberry Infused Ice Tea: Perfect for both Brits & Americans alike, this ice tea recipe is a fab alternative for those who prefer something non alcoholic. 9. Strawberry Wine Punch: With just a few ingredients this cocktail can be made ahead of time for a large batch cocktail and tastes pretty darn good too, especially if your a wine drinker like me. 10. Champagne Jello Shots: Welcome to the grown up version of Jello! This edible version of a French 75, is easy to make and and decorate ahead of time and then pull out of the fridge when ready to serve. 11. Watermelon Lime Hibiscus Cooler: Another great mocktail idea with Watermelon and if your looking for something with a bit more booze, just add tequila and some lime juice to make a watermelon version of a margarita! 12. 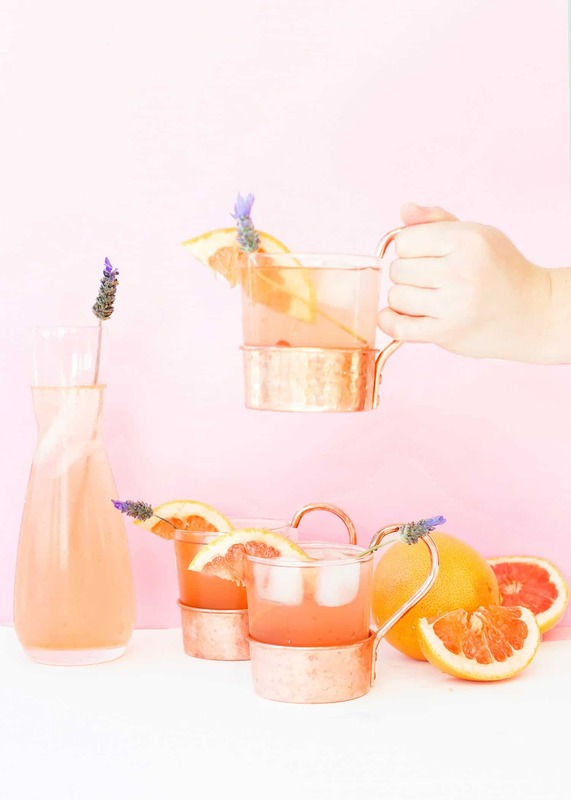 Spiked Peach Punch: A bright and fruity cocktail, the perfect big batch recipe for Spring & Summer! 13. Blueberry Mojitos: If your looking for a cool blue mojito that doesn’t resemble Gatorade, this is the cocktail for you! 14. Metropolitan Martini: This Metropolitan Martini is a twist on a traditional cosmo. It’s smoother than a cosmo and uses currant vodka instead of plain vodka which makes for a much tastier version, in my opinion. 15. Watermelon Mojitos: We seriously can’t get enough of these watermelon recipes can we? This time I promise it’s an alcoholic one! 16. Rose Lemon Spritzer: Seriously how pretty are these! This cocktail recipe uses rose water to get the cute pink colour in addition to lemon juice, Pomegranate juice, honey and vodka. 17. Vodka Pear Lavender Lemonade: I had never considered combining pear with lavender before but it sounds absolutely delicious! 18. Elderflower Spanish Gin & Tonic: Working in a local pub for most of my adult life, I can tell you that Gin & tonic is one of the most popular drinks in the summer, so I will bet my bottom dollar that there are a fair few gin lovers amongst you now. I think this spanish twist to the traditional gin & tonic is perfect if you want to make it unique! 19. Raspberry Beer Cocktails: Vodka. Good! Raspberry lemonade. Good! Beer. Good! Thats right this cocktail includes all three. This one is a little more tricky to make in batch as the drink would go flat if made up too far in advance, however there is nothing stopping you putting out each of the ingredients separately with instructions for your guests on how to make their own? 20. Sangrita: What do you get if you cross a Sangria with a Margarita? A Sangrita of course! 21. Ginger & Jasmine Rose Cocktail: Although I have never tried one of these – (I really want to!) I am imagining the flavours to be so intense. I think the idea of adding ginger and Jasmine together with a Rose wine is such an unusual idea but they really are some of favourite flavours, so gimme gimme gimme! 22. Pineapple Rose Sangria: Combine a bottle of Rose with pineapple juice, raspberries and blackberries and your pretty much have my favourite drink, EVER!!! 23. Guava Sangria: Just in case your not fed up with Sangria recipes yet – (Gosh! what is it with me, Sangria & Watermelons?) Here is a another! This recipe seriously takes me back to Mexico and anything that does that is a winner in my books! 25. Cider Rum Punch: We couldn’t leave you without sharing a cocktail for the cider lovers amongst you. Although not hot, I imagine this to be more of a winter warmer, please correct me if I am wrong. Either way it sounds totally delicious and is the perfect example of a cocktail that can be made in bulk. So tell me, which would be your favourite cocktail? Let us know in the comments below. Thank you for sharing different type of Cocktails. It looks so interesting and delicious, I will definitely try to make Mango & Plum Sweet Tea Cocktail for my colleagues. thanks for the great recipe ideas!! Mindblowing pictures by the way.